Heritage House – June opening hours – Wednesday – Friday 10 a.m. to 4 p.m.
Champney’s West Heritage Group Inc. is currently accepting applications for a Job Creation Partnership Project – PENDING FUNDING APPROVAL. 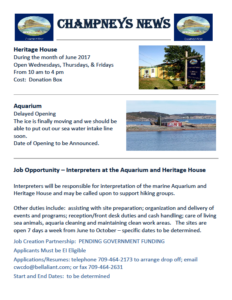 Interpreters will be responsible for interpretation of the marine Aquarium and Heritage House and may be called upon to support hiking groups. Other duties include: assisting with site preparation; organization and delivery of events and programs; reception/front desk duties and cash handling; care of living sea animals, aquaria cleaning and maintaining clean work areas. 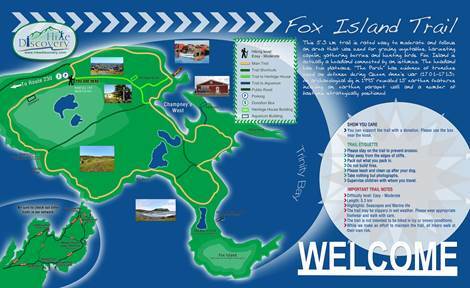 The sites are open 7 days a week from June to October – specific dates to be determined. 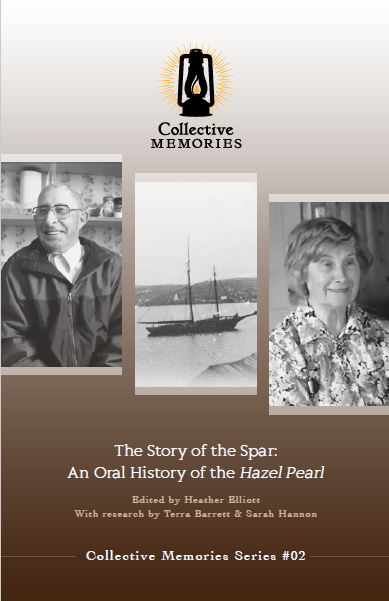 “The Story of the Spar: An Oral History of the Hazel Pearl” is the second booklet in the Collective Memories Series produced by the Heritage Foundation. This booklet focuses on the history of the Hazel Pearl and the memories of several community members about the wreck of the boat and the rescue of the spar. Hiscock was one of several residents of Champney’s West who was interviewed as part of the oral history project completed by the Foundation. The booklet which developed out of the interviews was edited by Heather Elliott with research conducted by Terra Barrett and Sarah Hannon. The booklet launch is open to the public and will include tea and light refreshments. There will be printed copies of the booklet available at the launch and a PDF version will be placed online. Quilting Party – Thurs, Nov 10th at 1 pm. We have partially completed quilts and material that has been donated to the Heritage House. Come join us in completing these projects. Elizabeth Freeman will be on hand to guide us through quilt making. Sewing machines and irons are welcome and needed! Tea and cookies will be shared. Please call 464-2173 to register. 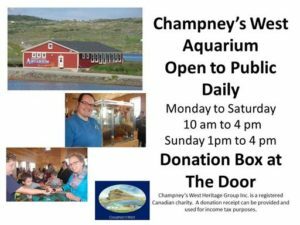 “The trail has been expanded from 2.7 km to 5.3 km to go right around the peninsula of Champney’s West. With the upgrades, the trail is now part of the provincial trail system along with famous local trails like the Skerwink in Port Rexton and Trinity’s Gun Hill. “So we’re all at the same standard now. We’ve got our kiosk and we’ve got our trail marked completely on it. We’re at the same as those trails in the provincial system,” Hiscock told The Packet. A team led by John Vivian put a lot of work into building the kiosk, developing the parking lot at the mouth of the trail and marking the trail. 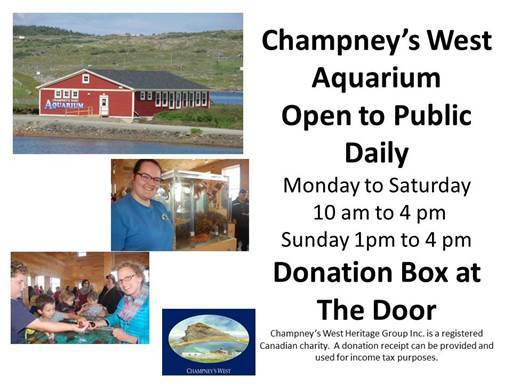 Champney’s West Aquarium continues to be open daily this week. Open again from Tuesday, October 11 to Friday, October 14th, when it then closes for the season.